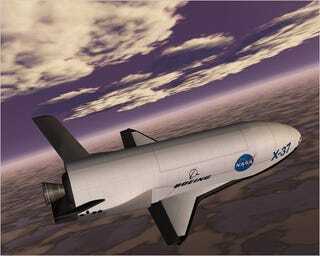 Remember the X-37B, that super-secret unmanned U.S. military space shuttle replacement no one knows anything about? Bad news, chickenhawks—it's most likely just a nonlethal high-flyin' spy plane. Weird news? Amateur astronomers totally know where it is right now. It's here: Roughly anywhere between 40 degrees north and 40 degrees south latitude at an altitude of about 255 miles, said Ted Molczan, an amateur sky watching aficionado from Toronto, in an interview with the New York Times. It circles the planet with a brisk 90-minute orbit. You see, while this craft is certainly all military, the behavior this bird exudes is pure reconnaissance. Every four days, for example, the X-37B passes over the same region of earth, which Molczan says is exactly what U.S. imaging reconnaissance satellites have been known to do. The military has also vehemently denied any weaponization of the project on countless occasions, so there's that too, if you're one to believe everything the military says at face value. Still, it could be a feint, right? The rumored death ray that I just made up just now could be deployed later, during the craft's long-rumored nine-month stay in orbit (thanks to solar panels). We'll be watching!